Non-fiction – hardcover; Granta Books; 128 pages; 2012. Review copy courtesy of the publisher. Lubbock’s condition was the result of a rare brain tumour situated in the left temporal lobe — the area of the brain responsible for speech and language. He was diagnosed in September 2008, told he had a year or two to live, and died in January 2011. He was 53. This extraordinary memoir is not so much a day-to-day journal of his life after diagnosis but a philosophical account of what it is like to confront death. And it is also an illuminating account of how speech and language are central to our being — and how the loss of these skills can be puzzling, frustrating and frightening. Essentially Lubbock is resigned to his fate — in fact, he describes it as “interesting”, almost as if he is going on an adventure — and he understands that it is “not something I’m going to get through or over”. Suppose I said: I can’t stand it — what would I do? This is not a marriage I can leave, a job I can resign, a country I can emigrate from, a prison I can try to escape. There are no terms to be come to. I could kill myself, so as to escape the intolerability of dying. Almost imaginable. I could try to get myself into a state where nothing that makes it matter to me does matter. Then I would be, in effect, already dead. Perhaps his ready acceptance — or what sounds like ready acceptance — is helped in part by the lack of pain caused by the tumour (the brain has no pain receptors). For much of his illness he is in otherwise perfect health, apart from the occasional fit and the minor side-effects caused by his treatment. But over time he begins to lose his language skills — and this, while not overly distressing nor unexpected, is obviously frustrating for one who relies on writing (and reading) to earn his living. He explains how he struggles to summon words when he writes and speaks, how sometimes the wrong words appear and his vocabularly gets mixed up and garbled. Reading seems to have given up entirely. I listen to people on the radio, and I cannot repeat their words, nor can I grasp their points, but I can sort of recognise the articulations that are being made, they’re there, beneath the surface. And at some time, I suspect, my speech will simply fail. Or rather, it will fail first of all at one competence, and then at another. Strangely enough, reading a memoir about a man dying is a life affirming experience; it makes you see things in a slightly different light and shows how we often live our lives blind to our own mortality. And yet Lubbock claims “my story doesn’t make a good story”. A good story would either be a steady descent towards death, or a total recovery. But I have had, probably will have, a fluctuating plotline, with ups and downs, recoveries, declines, rallies, with some kind of final wreckage or fade. I beg to differ. 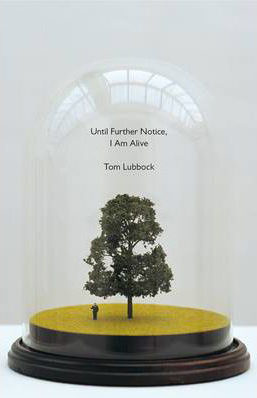 For such a slim book, Until Further Notice, I Am Alive is weighty with wisdom, insight and intelligence. It’s unflinchingly honest and candid, but it also exudes a beautiful sense of calm and dignity. And it’s certainly the most profound book I’ve read all year. My father-in-law died from brain tumour nearly 3 years ago. I’d love to read this book, but I worry it would make me cry (a lot! ), even if it sounds like my type of book. Your review makes me want to get it, though, read it and then pass it onto my husband and mother-in-law, if it’s appropriate. I recently read The Diving Bell and the Butterfly about the editor of a French fashion magazine (Vogue??) who has an aneurysm and finds himself unable to communicate with the world. It is a fascinating book and I really got an insight into what it must be like to be trapped inside your own body. Have you read it, Kim? We share the same fear, Kim. I don’t think I could read this one. Funnily enough, I didn’t find it a distressing or upsetting read. Instead, it made me think of my own life and the need to live each moment more fully and to not fritter away time etc. It made me think about my attitude to life. As for the Diving Bell and the Butterfly, I know a lot about that book but have never read it. One day I must read it. Hi Lisa, as I’ve just said to Kinga (above), it’s not a distressing read. Essentially it is food for thought — about how you live your life and what you do with the time you’ve been given. Lubbock was not one of those people who knew the end was nigh so therefore he had to travel the world and jump out of planes and climb mountains and do all kinds of crazy stuff, instead he wanted to enjoy art and culture more, spend quality time with his family and friends, and just go on living the life he has always lived but with more feeling. I found it a strangely uplifting read. I may end up reading this one, though this is among the scariest illness I’ve ever heard of. I also encourage you to read Diving Bell. Or you can watch the movie. Both are wonderful. Sounds awful and interesting and heartwarming and sad! I will add it to my list.